Your heart is the engine that keeps blood pumping throughout your body. When your heart doesn't work as well as it should, your body can't function normally. If you've had heart problems in the past, your doctor may recommend that you have a test to see how well your blood is flowing into your heart. Let's talk today about thallium and sestamibi stress test, also known as nuclear stress test. This is your heart. It's job is to receive oxygen-poor blood from your body, send it to your lungs to pick up fresh oxygen, then pump that oxygen-rich blood back out to your body. When your heart doesn't get enough blood, it can't work as well as it should. So, why would you need a thallium or sestamibi stress test? Well, your doctor may recommend that you have this test to find out why you're having chest pain, find out which treatment is best for your heart disease, check whether a treatment you've already had, such as medicine or surgery, is working, or see if you have coronary artery disease. So, what happens during the stress test? Well, you'll start to prepare for the stress test a day ahead of time. Don't eat anything the night before the test, and avoid any foods that contain caffeine for a full day beforehand. You'll have to skip your morning cup of coffee or tea, and avoid sodas and chocolate. Your doctor will let you know if you need to stop taking any of your medicines before the test. When you arrive at the doctor's office or medical center for the test, an intravenous, or IV line will be placed into your vein. 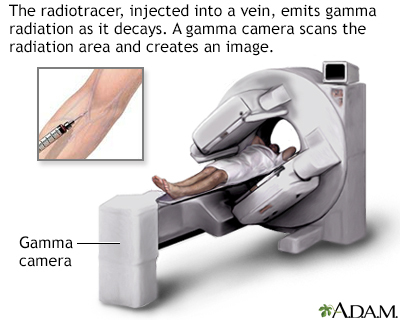 Through this line, a weakly radioactive substance will be injected into one of your veins. You'll lie down and wait for 15 to 45 minutes, and a special camera will take pictures as the thallium or sestamibi substance moves into your heart during a period of rest. Then you'll walk on a treadmill with EKG electrodes monitoring your heart activity. 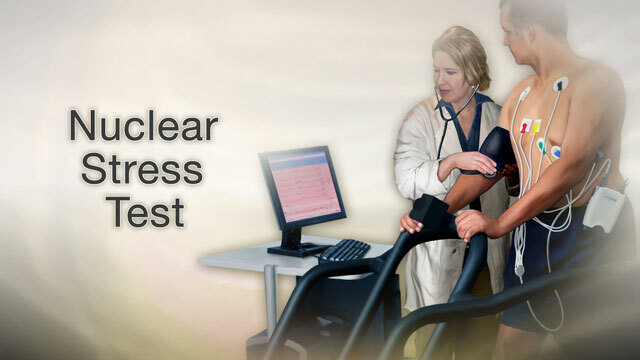 Once you've reached your maximum level of exercise you'll get another injection of the radioactive substance and your heart will be scanned to see how well the blood is flowing during a period of stress. If you can't exercise, you'll get a drug that will simulate the effects of exercise by making your heart beat faster. During the test, some people feel chest pain, shortness of breath, dizziness, or a fast heartbeat. Let the person who is doing the test know right away if you don't feel well. So, what do the test results mean? Well, your doctor will compare the first set of images to the second set, to see if you have heart disease or your heart disease is getting worse. If blood is flowing well through the arteries of your heart, then your test is normal. If blood isn't flowing well, you may have a blockage in one or more of the coronary arteries of your heart. In that case, you may need to have another test, or an angiography, stent or heart bypass surgery to open up a blocked artery. A stress test can help your doctor see how well your heart is working. Then, you can find out together which treatments you'll need to get your blood pumping smoothly again.